Android does multitasking. Not some watered down, limited-functionality-API-while-the-application-is-suspended multitasking like other phones (cough), but real, 100% Grade A multitasking. One big problem with Android’s multitasking, though, is that even though you can run everything simultaneously, it’s hard to jump between applications without returning to your home screen. 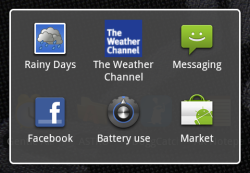 Sure, you can access a list of your 6 most recently used applications by holding the Home button (shown at the right). That’s great, but if the app you want to use isn’t in that list, you’ve gotta go back to your home screen, open the app drawer, and launch the next application. Same goes if you want to enable wifi while using the browser – you’re forced to go back to the home screen, open Settings, and make the change. Faruq Rasid, the developer who made the great home replacement HelixLauncher (a precursor to my new favorite, LauncherPro), recently released an app called QuickDesk that completely changes how Android does multitasking. QuickDesk works like a home screen replacement, with a twist – you set QuickDesk as your default home screen, then tell it what home screen you normally use. For all intents and purposes your original home screen will still be there, but it is now piggybacked on top of QuickDesk. When you want to start multitasking, double tap the Home button to bring up the hidden QuickDesk screen. This screen works just like a normal home screen, so you can add shortcuts, widgets, anything. The next time you’re using Twitter and want to change your screen brightness? Just double tap Home and use the Settings widget on your QuickDesk screen. Want to change your music track while playing Gem Miner? Just use the music widget in QuickDesk. QuickDesk gives you a fully-functional home screen that politely hovers over whatever app you’re currently using. The QuickDesk screen hovers over Touiteur. Besides adding your favorite apps to your QuickDesk screen, I like having a music widget, some type of settings widget or app (I use Quick Settings which has all major settings in one app), and apps I frequently use like email, messaging, browser, and phone. Simply put: this app is a game changer for multitasking and something I think the Android team absolutely needs to consider including in future versions. To download QuickDesk, simply search for it in the Android Market or scan the code to the right with the Barcode Scanner app. Oh and once you’re done with that, tell me what you think in the comments!